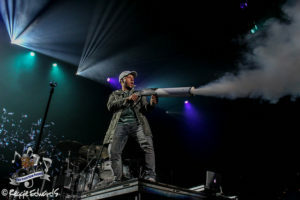 Each year, we get treated to two of the biggest package Christian tours of all time- Winter Jam and The Roadshow. 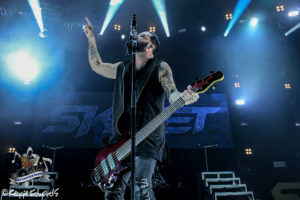 2017 has seen the addition to a third in the Air 1 Positive Hits Tour and they’re getting started with a bang in Gawvi, Tauren Wells, Colton Dixon, Britt Nicole and headliners Skillet. The tour recently made a stop at Lexington, Ky.’s Rupp Arena for a night that ensured anyone in attendance left exhausted. Prior to each band taking the stage, a video package played on the giant LED video screen, which featured each upcoming band discussing their faith and music. The night started off early with Gawvi, who had just recently signed a major deal with Reach Records- joining the likes of Lecrae, Andy Mineo, Trip Lee, KB, Tedashii and more. Needless to say, anyone who knows that label knew they were in for a great show and that’s what they got. With Gawvi joining the 116 Clique, he knows how to put on a show and how to get the crowd involved. With artists from that label playing tours like Winter Jam, Gawvi knew how to engage fans who may not have come for his style of music and made sure there were some new fans formed this evening. 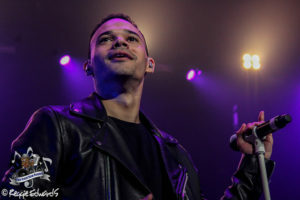 Taking the stage next and very quickly was Tauren Wells, who’s out to make a name for himself apart from Royal Tailor, who disbanded two years prior. As a solo artist, Wells brought in aspects of Tailor’s music but also threw in some shades of funk, soul and heavy R&B. Imagine Bruno Mars-meets-Stevie Wonder and that’s what you have in Wells’ solo work. Fans knew exactly what to expect with Wells’ set and did not leave disappointed. Before too long, Colton Dixon took the stage. Fresh on the heels of his latest record- Identity– Dixon is riding high on another wave of success. 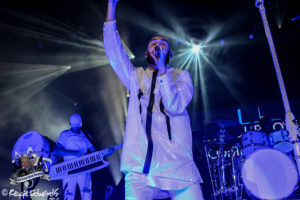 Himself and his band were decked out in all white and the production was just beautiful. With a short set, he didn’t have much time to talk or even throw in every song he knew fans wanted to hear, but he made sure to make a strong impact- and that’s exactly what he did. If one word can describe Dixon’s performance, positivity has to be the one. Britt Nicole was next up on the night and she took things in a similar direction as Dixon. She made sure every girl in the crowd knew and felt like they were perfect just as they are and that God loves them no matter what the world says. She talked about her family, her children and the hope she’s found in Christ and, even if you didn’t come for the message you left feeling inspired. Closing out the evening were Skillet, who have been on fire since releasing Unleashed last year. Having Skillet play a lot of the Christian arena tours is a good thing on so many levels. Ever since releasing Comatose in 2006, Skillet have been growing a huge fanbase in the mainstream/secular rock world. By having them headline these tours, it automatically brings in at least a few fans to the shows who aren’t believers in the same faith the bands share or that other fans at the shows share. Not only that but this particular date of the tour was just 45 minutes south of Louisville, where the annual Louder Than Life Festival would take place the next two days- a festival that Skillet played last year and that’s organized by the same fine folks who put on almost every major rock festival in the country. Skillet took the stage with authority, launching into a good-sized 14-song set, which is long for these tours- often times with Winter Jam or The Roadshow, the headliners (which has been Skillet many times in the past) only play six or seven songs, so this set was definitely impressive. They threw in a few gems for fans who have seen them multiple times, adding “Lions” to the set as well as a portion of “Be Thou My Vision” in addition to the Skillet set-staples that have been in there for years. 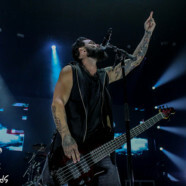 Frontman John Cooper is always energetic and fun to watch but something about this tour has seen him even more than ever before- jumping around the stage every chance he got and Lexington was no exception. Their production- as always- was top notch and one that makes you want to keep coming back for more Skillet and the band knows exactly when to slow it down and pick it back up again. Things are still just heating up for the band, just a year or so into the album cycle. They’ve been touring with this inception of the band for about six or seven years now and it shows. Their chemistry off the stage translates beautifully onto the stage and Lexington saw the band operating as tight as they ever have. While the sound mix wasn’t the best they’ve had, they still put on a great show and made sure that any fan who was seeing them for the first time or any fans who can only afford one concert each year got exactly what they wanted from this tour.